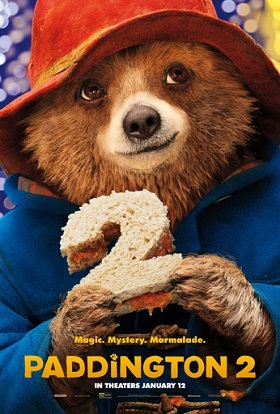 "Paddington 2 honors its star's rich legacy with a sweet-natured sequel whose adorable visuals are matched by a story perfectly balanced between heartwarming family fare and purely enjoyable all-ages adventure." "I'm gonna wait for the goofy gorilla review." Reviewing Paddington 2 at this point is less an exercise in reviewing a movie than reviewing the very idea of a reviewing a movie. It broke the record on the review aggregate site Rotten Tomatoes for most reviews for a movie that still managed to retain a "100% positive" rating on the site with 187 "fresh" reviews, beating the previous record holder, Toy Story 2, which had 163. And though Flayrah reviews do not count towards the 'Tomato-Meter', even if they did, I have no intention of Armond White-ing the movie. It's a good movie. See it. But it still is a bit disappointing that this movie is the one to make the end run past Toy Story 2. It's a bit like how the highest rated movie on IMDB is The Shawshank Redemption, a pretty good movie that still isn't even really ever in the discussion as the best movie of 1994. * Likewise, Paddington 2 isn't even as good as the first Paddington, which only managed a 98% out of 144 reviews. Recent, much more interesting movies to make runs at Toy Story 2 have included Get Out and Zootopia, which you'll note, besides being my last two year end favorites, are also about something. You can have a discussion or even argument about those two movies. Let's talk about the first Paddington movie for a second, especially since it failed to garner a Flayrah review back in 2015. After watching Paddington 2, the striking thing to me is how much "darker" and "angrier" a film that first movie really was. No, really, now, go with me here. The first movie's villain's plan is literally to kidnap and kill Paddington (voiced by Ben Whishaw). In the second movie, the villain's plan is... to read a pop-up book and put on a stage play afterwards. Okay, the plan is a little more complicated than all that. The pop-up book is rare and expensive, and down on his luck actor Phoenix Buchanan (Hugh Grant) wants it because it conceals a treasure map, which he will use to fund his stage play. He has no plans whatsoever to hurt anyone; at worst, his plans involve a little burglary. He does manage to steal just about every scene he's in at the least. Paddington is put in danger due to this plan, but this is both incidental and accidental. If Paddington also hadn't wanted the book (as a gift for his aunt back in Peru), he never would have even been involved. Paddington is blamed for the theft of the rare pop-up book, and sent to prison, which seems more than a little derivative of the prison sequences in The Grand Budapest Hotel. With it's overly nice, wrongly accused protagonist winning over his fellow inmates through the use of his innate charm and liberal application of sweet confections (also, lots of pink up on the screen). His adopted human family, the Browns, try to prove his innocence on the outside, while Buchanan searches for the treasure. Add in a lot of actually really great slapstick comedy, and that's basically the movie. It, like the titular character, is charming. Don't let my grousing about Rotten Tomato scores scare you off. Charming is enough, and makes it worth your time. I've also said the first Paddington is angrier, and that comes out in the character of Mr. Curry (Peter Capaldi), the only person in the neighborhood who doesn't like Paddington. He is constantly complaining about bears taking over the neighborhood in the first movie that makes it clear he's more concerned with Paddington's immigrant status than his species. He's even willing to help the villains (who, remember, have much more violent aims than Buchanan's) if it means getting rid of Paddington. He eventually comes to his senses when he realizes that they actually mean to kill Paddington, and he finishes the movie chastened but forgiven, because that's just the way Paddington is. He has a much smaller role in this movie, and he's backslid. He has returned to his bear-bashing ways. This time around, however, he isn't offered the small redemption he was given at the end of the first movie. This second film acknowledges he's a jerk, has the entire neighborhood call him out for being a jerk, and then leaves him behind. Between 2015 and 2017, 2016 happened. Okay, the political undertones of the character are more obvious and pointed in the original movie, and if it's less angry than just plain disappointed, the bear still has a few teeth left. *Full disclosure: Pulp Fiction is actually only my third favorite movie of '94; I'm one of those cinematic degenerates that actually like Forrest Gump and there was also, you know, The Lion King. Didn't see the first Paddington movie, and decided to see the sequel on a whim (though influenced by its critical reception). It's currently my favorite movie of the year so far (as early as it is). I can't imagine anyone seeing this film and not at least liking it, as you said "charming is enough". The time our hero bear enters the prison are the most fun, particularly when he introduces his cherished marmalade sandwiches to the inmates. In order to avoid waking a possibly sleeping, possibly just drowsing giant, I'm going to post this here, but, I mean, here's a recent comment on a professional movie review that vaguely reminded me of ... something. Haven't forgotten the time they DMCA'd FA. Their later response was more… measured, but I hope they learn what Disney et. al. did decades ago: there's no profit in a never-ending game of whack-a-mole, especially when you're trying to avoid drawing attention to the game while simultaneously wielding a very loud hammer.